We’ve been hearing (and reading) innovative growers talking about the relevance of vapour pressure deficit (VPD) for a while now. We’re seeing the difference monitoring VPD has made to our customers’ crop performance, and we’re always glad to see the word spreading. Earlier this week, an article in HortiDaily provided a nice breakdown of why this metric is so useful in crop management. As the article points out, VPD “is used by growers to assess how dry the air is at a given moment. If the air is too dry, photosynthesis will stop in order to protect the plant from exhaustion.” If there is insufficient moisture in the air, there is a risk of crops halting photosynthesis during key hours of daylight. In other words, VPD enables growers to make the most of sunlight for plant productivity. Growers and researchers alike are excited about VPD. But what is it? According to Michigan State research, VPD is a more useful metric than relative humidity. Wolleager and Runkle emphasize that because VPD is independent of temperature “when measuring plant transpiration and water loss, it provides greater insights than temperature and relative humidity on their own.” Read more of their findings here. 30MHz tech has always been designed with growers’ needs at the forefront. Developed with input from growers, the pointed microclimate sensor can capture plant temperature of individual crops, ambient temperature and relative humidity (RH). With the power of the cloud, though, we can anticipate “hot new metrics” like VPD based around these measurements. 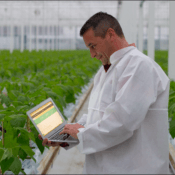 The ZENSIE platform is designed to make the most of customers’ agridata. With the data captured by the pointed microclimate sensor, calculations in the cloud can provide insights on dew point, vapour pressure deficit (VPD), absolute humidity (AH), humidity deficit and the absolute difference between air temperature and dewpoint. And we’re adding new calculations, based on customer needs– that’s the power of a cloud platform.